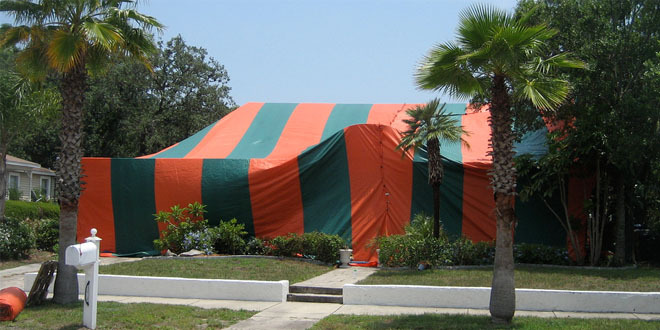 Structural fumigation is a pest control method that involves filling the airspace within a structure with a toxic gas. A tarp, or tent, is used over the structure to trap the gas inside. The gas penetrates cracks, crevices, and pores in the wood to eliminate pests, such as drywood termites and bed bugs. After the tarp is removed, fans are used to help the gas escape into the atmosphere. Leftover residues are not expected to remain on surfaces. The primary active ingredient in fumigants intended for residential dwellings is sulfuryl fluoride. Only certified applicators can use sulfuryl fluoride products because the U.S. EPA classified them as Restricted Use Pesticides (RUP). Certified applicators have been trained in the proper handling of the fumigant and fumigation-related equipment and procedures. What are some basic steps involved in a structural fumigation? The structure must be sealed with a tarp to trap gas inside during fumigation. The structure must be secured and warning signs posted to prevent people from entering the structure during fumigation. Because sulfuryl fluoride is a colorless, odorless, and highly toxic gas, chloropicrin (a highly irritating substance) is commonly used as a warning agent to clear people from the structure. After fumigation, the tarp is removed and the structure is aerated. Applicators conduct air monitoring procedures to make sure sulfuryl fluoride levels do not exceed the EPA established limit of 1 part per million (ppm). Occupants are not allowed to reenter until the applicator checks are complete. Inform your neighbors. Ask them to keep pets and children away from the structure during fumigation and aeration until occupants are permitted to reenter. Remove all people, pets, fish, reptiles, and houseplants from the home because sulfuryl fluoride can be toxic to all living things. Prevent pockets of gas. Remove waterproof covers on mattresses and pillows. Remove or double bag all food, feed, tobacco, and medications that are not enclosed in plastic, glass, or metal packaging with the manufacturer's original air-tight seal intact. This includes items in the refrigerator or freezer. Your applicator will generally provide special bags for this purpose. Open all indoor drawers and doors, including attics, storage chests, cabinets, closets, and appliances (dishwasher, microwave, etc.). Unplug or turn off electrical heating elements and turn off automatic switch controls for appliances. Although sulfuryl fluoride is not flammable at room temperature, pilot lights and any open flames must be turned off. Speak to your applicator ahead of time regarding any additional questions you may have. Currently heat or thermal treatment is the only "whole-structure" alternative to fumigation, though localized or spot treatments may also be available. Contact your local Cooperative Extension Service and/or the Bio-Integral Resource Center (BIRC) for more information about these methods. If you have questions about pesticides in the environment, or any pesticide-related topic, please call NPIC at 1-800-858-7378 (8:00am - 12:00pm PST), or email at npic@ace.orst.edu.